JAILLOT - Les deserts d'Egypte de thebaide d'arabie. 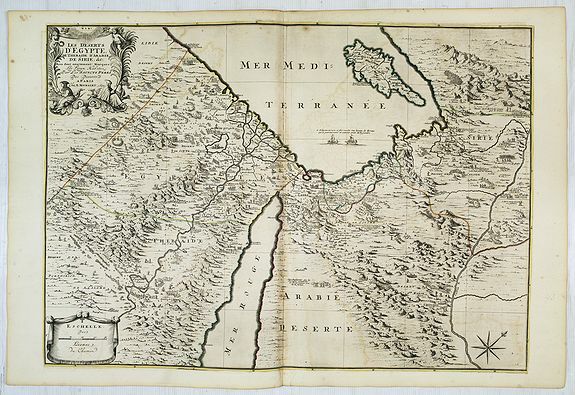 . .
JAILLOT, H. / MORTIER, P. - Les deserts d'Egypte de thebaide d'arabie. . .
Les deserts d'Egypte de thebaide d'arabie. . . - JAILLOT, H. / MORTIER, P.
Title : Les deserts d'Egypte de thebaide d'arabie. . .. Size : 20.9 x 33.0 inches. / 53.0 x 83.8 cm. Description :Fine map of Egypt with a decorative title and scale cartouche. Condition : Printed on heavy, somewhat browned paper. Some minor marginal spotting. Else a good dark impression.